When an animal goes unclaimed from the pound after 5 working days, PAWS takes responsibility for them, paying for spaying/neutering, vaccinating, and finding them good, loving homes, if we are unable to find owners after a reasonable amount of time (generally a few weeks). The ONLY time an animal is euthanized is when it is absolutely medically necessary; NEVER for lack of space. This has been true ever since PAWS began more than 5 years ago. This is one of the reasons why we are unable to help every person who wants to surrender an animal to us. As a foster-based organization, we request people to foster their pet while we help them search for a new home, by posting them here on Facebook. 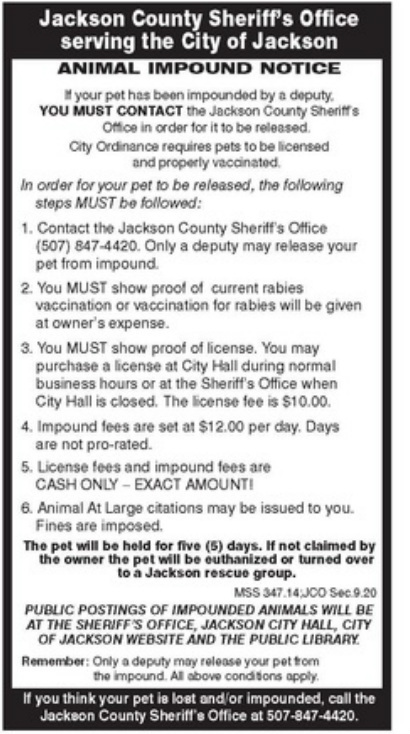 Any questions, please feel free to email us at pawsofjackson@gmail.com - thanks so much! For information on claiming your animal from the pound, please read the information below.